• The company was honored with two Innovators Awards – Silver & Bronze Levels from Vision Systems Design (VSD) at a special ceremony in Chicago on April 8, 2019. SYRACUSE, N. Y. 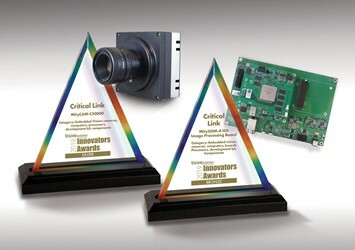 - April 11, 2019 - Critical Link, LLC, experts in image sensor technology, system-on-chip (SoC) and field-programmable gate array (FPGA) designs, vision protocols, and signal processing, received two prestigious Innovators Awards, a silver and bronze, presented at the Fifth Annual Vision Systems Design Innovators Awards program on April 8 during Automate 2019 in Chicago, Illinois. The MityCAM®-C50000 was honored with a silver award in the Embedded Vision category by a panel of esteemed experts. Critical Link’s MityCAM-C50000 is an open architecture platform that allows for user programming, and a design that allows for hardware customization. The embedded vision platform enables developers and OEMs to embed their image-processing algorithms and application IP on-board the system. The MityCAM-C50000 was developed around the CMV50000 sensor from ams / CMOSIS. It is a global shutter sensor featuring 47.5MP resolution (7920 pixels x 6004 pixels) at 30 frames per second, mono and RGB color options, with low dark noise and high dynamic range. The sensor outputs in subLVDS mode and provides special capabilities in binning, subsampling, and on-chip corrections. Critical Link’s MitySOM®-A10S-DSC earned a bronze award in the Embedded Vision category. The MitySOM-A10S-DSC is a production-suitable image processing board that features the Intel/Altera Arria 10 SoC. It is part of the company’s latest family of industrial performance system on modules (SOMs). The board includes dual-core Cortex-A9 ARM, up to 480KLE user-programmable FPGA fabric, 12 high-speed transceiver pairs, and up to 6GB DDR4 RAM. It features dual-side connectors for use in stack-through configurations, a unique benefit to developers of next-generation embedded imaging and machine vision applications. To learn more about Critical Link’s System on Modules and embedded imaging platforms, visit the company’s booth #339 at SPIE Defense & Commercial Sensing, Baltimore Convention Center, April 16 - 18, 2019 or go to: https://www.criticallink.com/products. About the Company: Critical Link, LLC (Syracuse, NY www.criticallink.com), founded in 1997, develops embedded systems solutions, system on modules (SOMs) and imaging systems for a wide variety of electronic applications. As experts in image sensor technology, system on chip (SoC) and field-programmable gate array (FPGA) design, signal processing, and vision protocols, we support all product development tasks, from concept to final production. Our flexibility allows us to deliver full lifecycle support and services at any step along the product development path, when and where needed, to effectively keep costs down. From engineering to hardware and software development, and mechanical engineering to prototyping and manufacture/assembly, Critical Link is committed to helping our OEM customers reach their project goals quickly and cost-effectively. Privately held, Critical Link is a Platinum member of the Intel FPGA Design Services Network and Intel IoT Solutions Alliance, and is ISO 9001:2015 registered by SRI Quality Systems Registrar. About The Vision Systems Design 2019 Innovators Awards Program: The VSD 2019 Innovators Awards’ expert judges reviewed and recognized the most innovative products and services in the vision and image-processing industry. Criteria used in the Innovators Awards ranking included: originality, innovation; impact on designers, systems integrators and end-users; fulfilling a need in the market that hasn’t been addressed, leveraging a novel technology, and increasing productivity.